Technical and goal keeper training is canceled tonight, Friday April 19th due to the weather and the field conditions. Fingers crossed we start to see some warmer and less 'rainy' weather next week and onwards! Because La Forza Soccer Club is a non-profit organization we are able to participate in the AmazonSmile program. By clicking the AmazonSmile image BEFORE you shop on Amazon, Amazon will donate 0.5% of eligible purchases to La Forza. La Forza Soccer Club was founded in 1994 as a non-profit organization based in Fenton, MI. Our goal is to develop player ability, fitness, and self-confidence in teams that play soccer at a competitive level that fans enjoy. 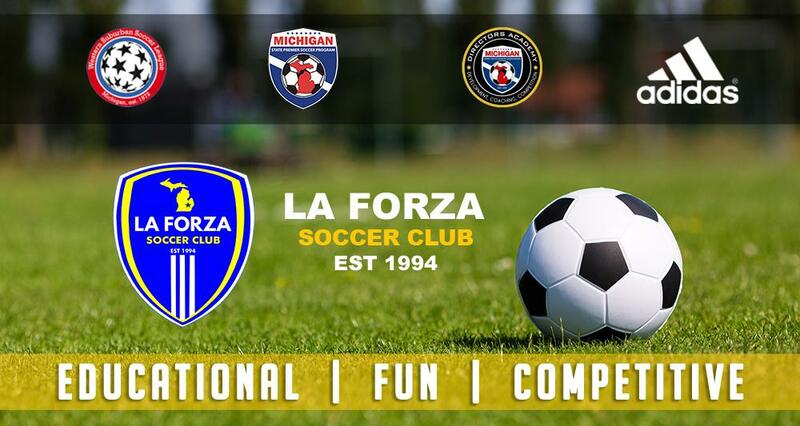 La Forza Soccer club is committed to providing an excellent opportunity for players of all talent levels from the Fenton and surrounding areas to develop their maximum soccer potential. Our coaching staff are dedicated to the development of players, working hard to develop player skills thru technical and tactical training to take players to their highest playing level. Most importantly, in La Forza Soccer Club we will develop a players love for soccer by encouraging skillful and fair playing. We encourage you to consider La Forza Soccer Club for your son or daughter, as we are committed to providing high quality coaching, technical skill development training, and competitive play for players of all ages and skill levels.